Mac/PC. This desktop sync client is convenient for storing a large collection of files that would otherwise take a long time to upload. 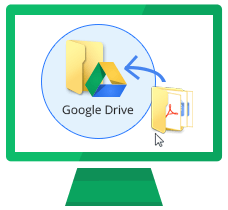 Google Drive for Mac/PC is only available if your administrator has turned it on for your organization or team. 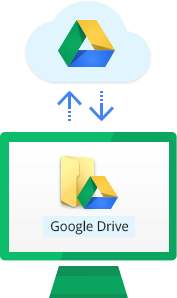 To use the client, you install Drive on your computer, which creates a desktop folder named Google Drive. This folder works like any other folder on your computer, except that anything you put in it automatically syncs to the web and to any other devices with Drive installed. Now that you’ve installed Drive on your computer, you can store files right from your desktop. Move the files and folders into the Drive folder on your computer. From now on, these files exist in the Drive folder and are synced with other devices that also have Drive installed. If your Internet connection breaks or you need to go offline in the middle of a sync, Google Drive for Mac/PC picks up where it left off when you’re back online.